Have you ever been at a wedding and wondered what is being said in the whispered conversations between the groom and the best man as they stand awaiting the bride, or what the father of the bride’s sentiments are towards the groom, or even what the bride and groom really think of each other? 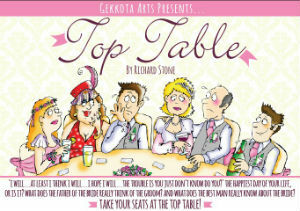 Richard Stone’s play, ‘Top Table’, invites you to be a fly-on-the-wall at the wedding of Lisa and Martin and gives you an insight into their innermost thoughts on the big day. 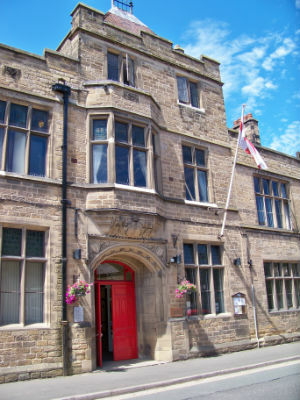 As the ‘congregation’ (audience) arrived at the wonderful and appropriate venue of Spring Bank Arts Centre, a beautiful converted church in New Mills, each person was greeted with “Welcome to the wedding!” On the stage, the top table was laid out, the wedding cake in pride of place at the centre, setting the scene instantly. Furthermore, the audience was also invited to sit at the other two long tables running from the stage, also bedecked in burgundy table runners and carnation posies (congratulations to Laura Stone as Designer/Stage Manager). Many of the guests had made a special effort and were dressed in their finery, buttonholes and all. This all contributed to the anticipation and excitement of what was to come and fostered the sense that we were all part of the occasion. This feeling was nurtured by being offered a glass of Bucks Fizz as we sat — a nice touch — and proffered a programme in the style of an order of service. The lights dipped and the organ music filled the room as the show (wedding) began. From this point on, you forgot you were in the audience and, instead, became absorbed in the scene playing out before you — Martin, the groom (played by Ryan Mitchell), and his best man (Chris Milward) at the altar, awaiting the arrival of the remainder of the wedding party. The primarily young cast from Pomegranate Youth Theatre and Gekkota Arts demonstrated a mature understanding of what is required to bring a character to life. Both Mitchell and Milward were not afraid to embrace long silences whilst their mannerisms and expressions communicated their characters, which were then embellished through the natural dialogue. This was echoed in the performances of Rebecca Brown as the bride and Katy Dent as the bridesmaid. However, it was during the monologues that the outstanding talent of these young people became evident. In particular, Mitchell and Brown displayed a wide range of complex emotions as they expressed their fears and explained some of the backstory to the audience. Mitchell was captivating as he described how he had felt violated following a drunken encounter whereas Brown exhibited perfect timing, engaging with audience members as she elaborated on her vows, “I will…at least I think I will…I hope I will.” This would have been even more effective should there have been additional lighting on their faces which, unfortunately, were slightly in shadow when facing the audience. Despite these moments of pathos, there was also ample to make you laugh out loud, both through the dialogue and the physical comedy. From the bustling mother of the groom (characterised to perfection by Carole Copeland) thanking each audience member for coming, slipping something extra from her hip flask into her drink and constantly confusing actors and the characters they played (anyone remember Terrance Stamp in ‘Alfie’ or John Wayne in ‘High Noon’?) to the entertaining exploits of the supporting cast, including the scene-stealing dancing of a guest in a black mini-dress and the reluctant swaying of another, having been dragged on to dance by the mother of the groom. Particular mention must be made of the exceptional performance by Robert Laughlin as father of the bride, who made us howl with his facial expressions (especially when he accidentally found himself cupping a body part of the mother of the groom after a trip — all done to great effect in slow motion) and ache in empathy during his soliloquy when he expresses his pain at losing his precious little girl, his whole world since the death of his wife. Congratulations to Richard Stone, who not only wrote but also directed this play and who brought out the best in this exceptional group of actors.